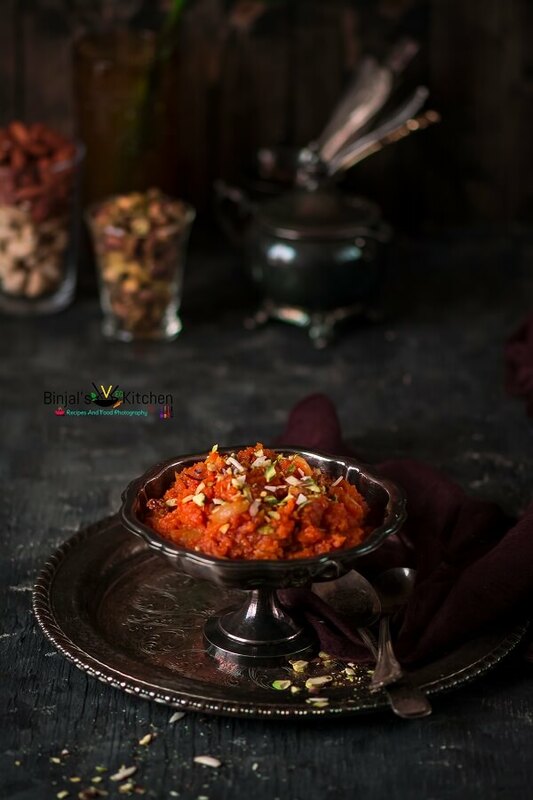 Gajar Halwa is a carrot based pudding rich in taste. 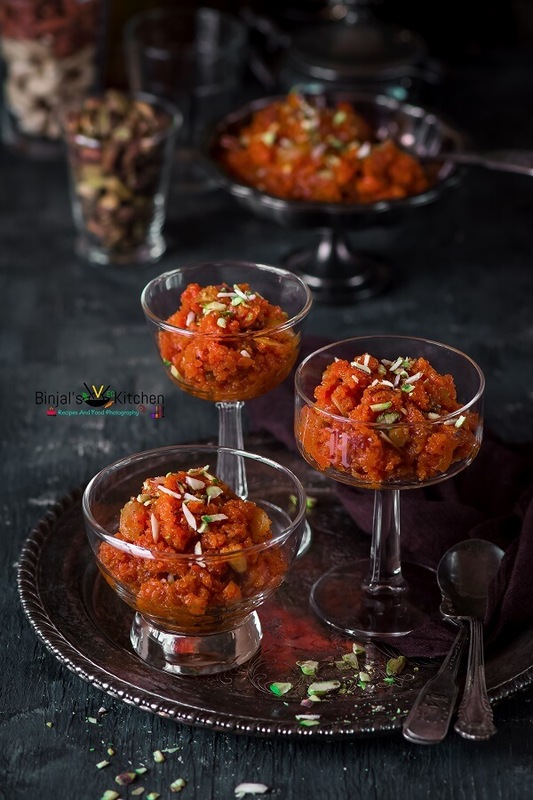 Gajar Halwa is a mouth watering popular dessert. Gajar Halwa is traditionally eaten during all the festivals in India. Gajar Halwa is very popular in north India that is adorned by everyone. 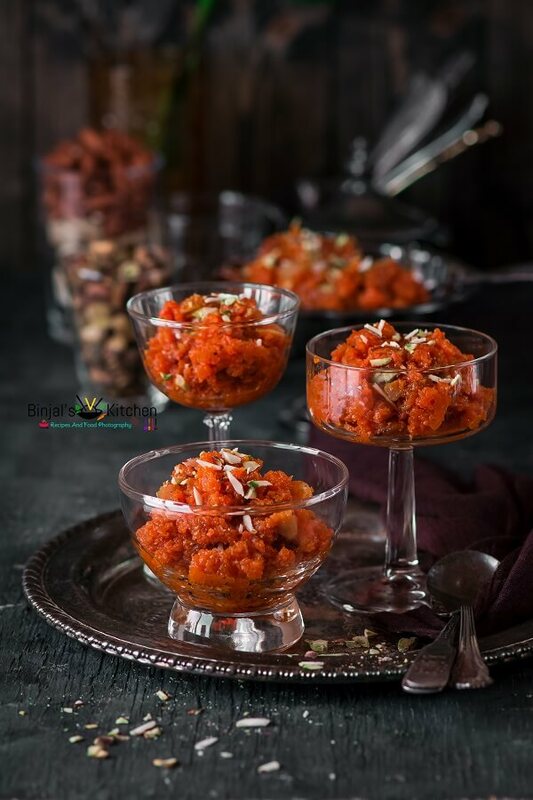 There are different ways to make this sweet delicacy, this is the traditional way of making Gajar Halwa because the traditional method of making a sweet yields the richest taste! I have tried this recipe in microwave as well as a pressure cooker, but Gajar Halwa tastes best when it is cooked with its traditional way. 1. Wash and clean the carrots, peel it, and then grate into the bowl using the thin grater. Soak the Saffron Threads into the 2 tbsp of milk and keep it aside. 2. Heat the ghee in a large pan, add the grated carrots and stir fry it till sweetened smell or 5-6 minutes on medium flame. 3. Add milk and stir it occasionally till half of milk evaporated. 4. When half of milk evaporated, add dry fruits, raisins and stir it again on medium flame till all milk evaporated and become creamy mixture or till 15-20 minutes. 5. Add soaked saffron threads, cardamom powder, mix well and again stir it for 5 minutes. Add sugar and mix it well. 6. Stir the mixture till all sugar well dissolved, now turn the flame on medium to high and stir it till the whole mixture becomes semi dry, now you will see the Halwa leave the bottom of the pan and mixture become non sticky. 7. Gajar Halwa is ready, garnish with some chopped dry fruits and serve. • You can use the food processor for carrot grating instead of thin grater. • You can store the Gajar Halwa in air-tight container up to 4-5 days in a refrigerator. • Adjust the sugar quantity as per your taste. • You can use 1cup evaporated milk instead of 2 cup whole milk. Gajar Halwa is mouthwatering popular dessert from north India that is adorned by everyone. Gajar Halwa is traditionally eaten during all the festivals in India. 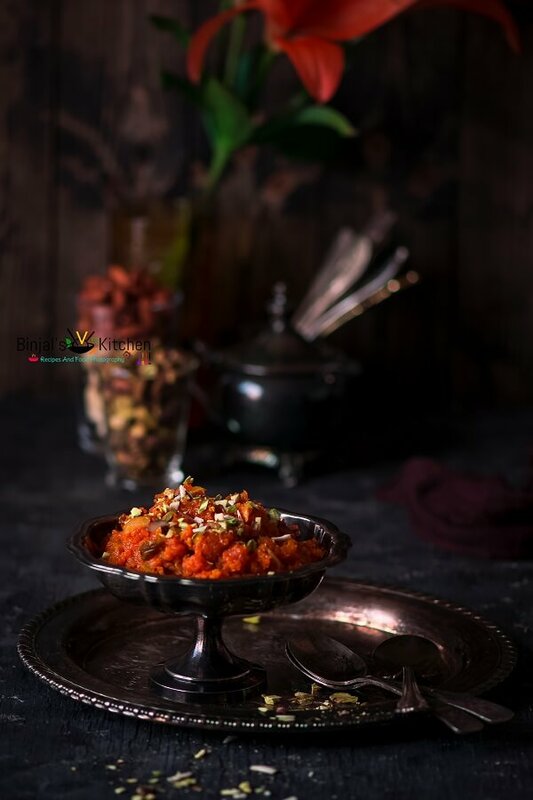 There are different ways to make this sweet delicacy, this is the traditional way of making Gajar Halwa because the traditional method of making a sweet yields the richest taste! Wash and clean the carrots, peel it, and then grate into the bowl using the thin grater. Soak the Saffron Threads into the 2 tbsp of milk and keep it aside. Heat the ghee in a large pan, add the grated carrots and stir fry it till sweetened smell or 5-6 minutes on medium flame. Add milk and stir it occasionally till half of milk evaporated. When half of milk evaporated, add dry fruits, raisins and stir it again on medium flame till all milk evaporated and become creamy mixture or till 15-20 minutes. Add soaked saffron threads, cardamom powder, mix well and again stir it for 5 minutes. Add sugar and mix it well. Stir the mixture till all sugar well dissolved, now turn the flame on medium to high and stir it till the whole mixture becomes semi dry, now you will see the Halwa leave the bottom of the pan and mixture become non sticky. Gajar Halwa is ready, garnish with some chopped dry fruits and serve.